The Perth 2018 calendar for December is already well underway. But, being a busy city, there is still plenty to do. And though well-known for the MCG, the Melbourne Cricket Ground, there are many other exciting and attractive options for locals and tourists in December. If you’re going to end up missing this year’s annual December celebrations, make sure you mark your calendar and plan ahead for next year. And don’t forget that when you need transportation, you can depend on Perth bus hire to get you from place to place conveniently. The Christmas Lights Cruise runs from 1st December 2018 through 6 January 2019. It is an annual event that should never be missed! Every year, the waterways of Mandurah spring to life with the incredible Canals of Mandurah Christmas Lights Display. The event is magical as Christmas themed displays, snow globes, twinkling stars, reindeer and sleds, snowmen, Santa, and Christmas trees decorate the luxury canal homes. Just to add a touch of Aussie, kangaroos and dolphins are worked into the water crafts, private jetties, and opulent stairways. Sit and gaze in wonder or sing holiday songs along with the carollers on the balconies. This free event runs from 17 December 2018, through to the 21st and transforms London court into a winter wonderland just in time to celebrate Christmas. Popular with international visitors all the way to locals, this retail arcade is known for its unique architectural design. It even goes so far as to feature, at its Hayes Street Mall entrance, a replica of Big Ben which chimes every 15 minutes. With Santa appearing daily, at specific interludes, the historic shopping Lane experiences a snowfall. Bring the kids, or come alone, but don’t miss this celebration. Held in December 2018, from the 19th to the 21st, beginning at 6:30 PM and running until 10 PM, locals and visitors will be able to visit the Supreme Court Gardens for the Christmas Nativity. Get there early enough with your low back chairs or your picnic blanket and you can set aside the perfect spot. Visit the many food vans on site or bring a picnic basket. Even if you don’t get close enough to the main stage to see clearly, on each side of the stage there are two big screens, so everyone will have a perfect view. Who doesn’t love a free event? 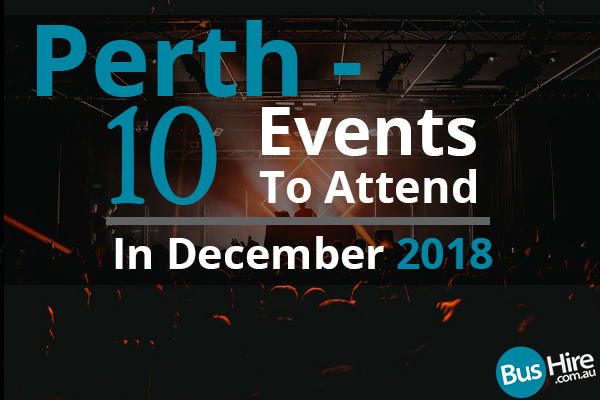 At Perth’s Langley Park, on December 15, 2018, classical musical hits, sing-alongs, and Christmas fun can be experienced everywhere you turn. The celebration wraps up with an impressive show of fireworks. In the meantime, listen to the sounds of the West Australian Symphony Orchestra. This is the largest outdoor Christmas concert in Perth. On 23 December 2018, a section of Belmont Avenue is closed for the day to allow the annual Christmas Street Party. Possibly the best part is – it’s free! The festivities run from 4 PM to 7:30 PM with incredible dinnertime deals, street chalk art, markets, a DJ, fairies, wall climbing, roving entertainment, live music, and of course… Santa Claus. This year’s event features a new grand opening at The Forum – The Sporting Globe. If you still have some Christmas shopping to do, this is the place. While the kids get their photo taken with Santa, you can shop over 140 store locations. And just to entice shoppers, if between December 17 and the 24th, they spend more than $50 at a Belmont Forum specialty store, they could win a gift! Christmas is celebrated for one month starting on 25 November and running until Christmas Day, 2018. The event is filled with people but still maintains a relaxing atmosphere. Come alone and enjoy your new Perth family, or bring your own family, but be sure not to miss this celebration. For six years this festival has been in existence, with each year seemingly becoming more and more successful. Bring your kayaks and bathers or simply come to enjoy a Christmas Day lunch. After an invigorating swim you can enjoy the “everybody bring a dish” lunch until you can eat no more. This festival lasts not one, but two days, running December 30 through the 31st of 2018. If you choose to skip the next two celebrations listed here, you can simply stay for the New Year celebration taking place here. The entire event takes place at Perth Foreshore’s Langley Park and is sponsored by Triple J Radio Station. This year’s event has a new venue which sponsors feel will better serve the community and visitors. Access to the park is relatively easy. This celebration has taken place for 12 years now, and features some of Australia’s biggest acts playing music. There are many extremely popular events taking place for New Year’s Eve. Tourists and locals alike flock to these next few events every year. Perfect for couples and families alike, you will not soon forget this amazing New Year’s Eve celebration. Everyone in attendance will be entertained for hours with disco lights, a live DJ, and fireworks to celebrate New Year’s Eve. Families (and any number of individuals) will appreciate this event being smoke-free and alcohol free, yet spectacular in its own right. There are numerous activities for children and adults including amusement rides, a disco setting, music, and more. The fireworks begin as the sun sets, so attendees will see not only a light show that is man-made but begin with a spectacular sky presented by mother nature herself. The years have quickly flown by and, again, it’s time for the Mindarie Marina New Year’s Eve fireworks celebration. This auspicious event brings partiers from far and wide and is an undeniable favourite New Year’s Eve gala. And though every year seems like the best, the following year always seems to somehow outdo it. Old and young alike will be fascinated by the spectacular lights and sounds. Buskers, pop up street food stalls, street performers, and more will entertain on the boardwalk from 5:30 PM on. Officially, at 8:30 PM the show starts and will illuminate the sky for no less than one quarter of an hour. Got kids? This is the perfect New Year’s Eve family celebration centred around children. So often, parents hesitate to celebrate on New Year’s Eve because – what do you do with the kids? This event solves the problem and is put on by Perth Zoo. The children’s event begins at 3:30 PM and runs until 8 PM. After that, of course, the children can return to their accommodations and fall asleep from sheer exhaustion. And that’s when the parents can look into Perth bus hire for transport to their evening’s adult New Year’s celebration.